Escape the city and spend a day at the Punta Arena beach with this all-day package. 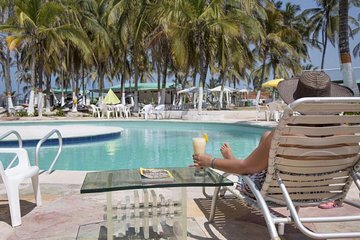 Located on Isla Tierra Bomba, which is only 10 minutes by boat from Cartagena, Punta Arena boasts white sand beaches where you’ll be able to relax on lounge chairs and enjoy the crystal clear waters. Plus, a traditional Caribbean lunch, along with a drink, is included.